Nenette Polish Brush Ref: NBRUSH - refil sold seperately see related products. * The Amazing ‘Shining dust eater’ brush is available again. * Supplied in handy storage tin. * Supplied pre-impregnated with polish. The Amazing ‘Shining dust eater’ brush is available again. Having been widely available many years ago, we at Hamilton Classic have managed to locate the factory and become an importer to the UK of this very popular dust/polish brush. 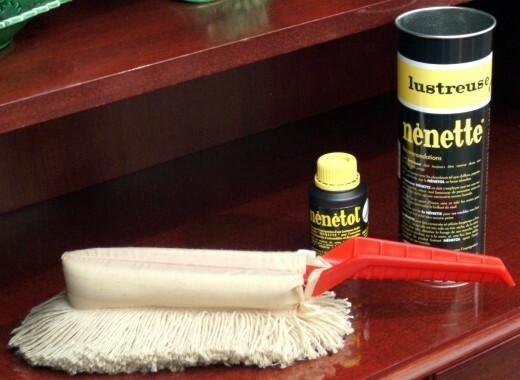 The soft mop is impregnated with a petroleum polish called nenetol, this helps the mop to collect all dust on the car and polish the surface. This polish is the envy of all modern duster brushes that have followed on from the original Nenette. The petroleum based polish will not harm any polish that has previously been applied to the car. When the mop is dirty simply untie it from the handle and hand or machine wash, once dry the mop can be re-impregnated with the refill bottle and is again ready to use.